and use them in some way that brings glory to you. Lord, may I glorify you. and all that I’ve gleaned. All of my life I lay at your feet. 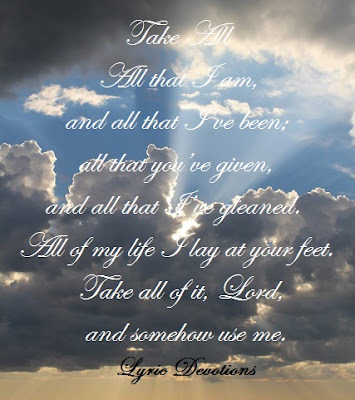 Take all of it, Lord, and somehow use me. and then lead me to hearts that I might reach out to. Lord, may I reach out for you. and direct all my paths that I serve only you. Lord, may I serve only you. and transform them all into your perfect will. Lord, may I be in your will. At the time that I wrote this song I was simply seeking the Lord’s guidance. I wanted to serve him in some way, but I just didn’t know exactly how or where. I knew that I had learned and grown as a Christian through the trials and difficult situations that God had brought me through, but I also knew that if I was so focused on my own trials and triumphs, that I never looked beyond myself, I was of no use to him. The Bible says, “Who comforteth us in all our tribulation, that we may be able to comfort them which are in trouble, by the comfort wherewith we ourselves are comforted of God.” I am to learn from my experiences in order to help others who may be facing similar circumstances in their life. God can even use the experiences of my life before salvation to give me an understanding heart and a burden for the lost. But all of my life’s experiences, good or bad, and the wisdom gleaned from them, as well as all my gifts and talents, have to be surrendered to him before he can use me. I had spent some time writing down what I thought my gifts were, what areas I had experience in, and what or who I had a burden for, then I gave all of it to the Lord. As so often happens, the desires and burdens of my heart soon came out in the form of a song. Romans 12:1,2 I beseech you therefore, brethren, by the mercies of God, that ye present your bodies a living sacrifice, holy acceptable unto God, which is your reasonable service. And be not conformed to this world: but be ye transformed by the renewing of your mind, that ye may prove what is that good, and acceptable, and perfect will of God. 2 Corinthians 1:4 Who comforteth us in all our tribulation, that we may be able to comfort them which are in trouble, by the comfort wherewith we ourselves are comforted of God.